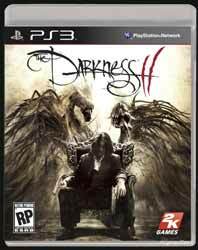 The Darkness II is a first person shooter (FPS) based on the Top Cow comic book and is a follow up to the 2007 game. This game fuses your typical FPS with a sci-fi storyline that lets the developers have a little fun with the genre. There are two main games. The first is the main Campaign mode and the second is Vendettas, which allows you to choose from four characters each with unique powers. This game mode is a lot like Left 4 Dead. In the main Campaign mode you play Jackie Estacado, head of a New York criminal gang, who is host to The Darkness, a strange alien entity that allows Jackie to manifest tentacle-like arms with heads full of razor sharp teeth. These can be controlled during game play so that you can use both the tentacles (to rip enemies in two/grab them/destroy or pick up hard to reach items) as well as using your human arms to let rip with firearms. If you pick up the enemies and then kill them you are treated to a random (but rather gory) death scene for the poor victim. The game is made up of levels where you simply have to dispatch the bad guys. You can use your Darkness powers only in areas were there are no lights, so it's a good idea to keep an eye out for lights and then shoot them out or, if they are resistant to ballistic weapons, find the light's power source and destroy it. You can use numerous elements in the environment as weapons (you can pick up poles and hurl them at your enemies - impaling them causes instant death; rip off car doors and use them as shields and then throw them at your enemies in order to slice them in two). Every time you kill an enemy you gain dark matter, which can be traded at certain points and used on your skill tree. Here you can add skills and that will help you as the game gets increasingly more difficult. To replenish your energy you simply rip out your enemies hearts and feed on them. As the story unfolds you start to learn more about yourself. Are you really the head of an organised gang gnag? Or, more likely, are you a delusional wacko that's locked away in a psychiatric ward while the doctors attempt to help you so that you can be integrated back into society? Is Jenny really your dead girlfriend, or a nurse who's treating you for your mental condition? The story is the work of Paul Jenkins, who previously worked on the comic book. It's quite an engaging storyline. The cut sequences are designed to look like a comic book, and work surprisingly well... apart from some ropey lip syncing. Another aspect that's worthy of note is Tim Wynn's score. There's no doubt that the music adds a great deal of emotion and atmosphere to the game. However, whereas most composers would have phoned in some of the atmospheric tracks, these are given as much care and attention as the emotional Jenny theme and closing credits music. In fact, it made such an impression on me that I actually watched the closing credits to find the composers name to see if a soundtrack release was in the works. Sadly there isn't any plans for this, but you can listen to just over 25 mins of music from the game at Wynn's website (http://timwynn.net). The other game mode is Vendettas where you can chose to play as one of the following characters, all of whom have different Darkness abilities and weapons: J P Dumond (Midnight Staff); Jimmy Wilson (Dark Axe); Inugami (Kusanagi); and Shoshanna (Arm of the Knight). Of all of these I found Jimmy to be the most fun (throwing the Dark Axe around is pretty amusing) while Shoshanna was probably the most useful (her Darkness fuelled pistol packs a meaty punch). You can either play Vendettas online with other players or offline. If you opt to play offline you can either play the Campaign story mode or Hit List missions (which breaks down the Campaign allowing you to chose individual missions as well as changing your character for each mission if you wish. Hidden around the levels of both of the main gaming modes are "Relics" collect these and they become available to view in the main menu, with a humorous audio description of their history provided by Johnny. The Darkness II is well worth adding to your collection if your a FPS fan. While the main story mode is a little short (most will be able to finish it over an afternoon or at the very least a lazy weekend) there is much replay value and the addition of the Vendetta game mode make this feel like two great games for the price of one. If I had one complaint, it's that you can't opt to replay an earlier level of the game (only restart the level you're on or go back to the last checkpoint). There's one segment of the game, very near the end, where you have to make a choice on how the game will pan out. It looks like I'll have to replay the game if I want to see what would have happened if I's chosen the other option.